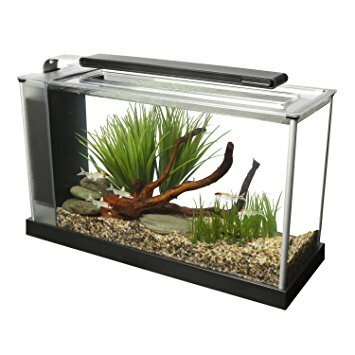 The Fluval Spec V Aquarium is another great addition of small compact aquariums. Buyers trust the quality of Fluval products as they are manufactured to the highest standards. This advanced aquarium system is capable enough to maintain a healthy flow of water inside so that your fishes can stay alive. This product is rated high regarding design and performance as well, and that is why we decided to review it for you. These details will help you to make an easy decision about your upcoming purchase. The Fluval Spec V Fish Tank is a sleek looking fish tank, with well-polished glass walls and with 37 LEDs which alongside the aluminium trim gives the fish tank a glow that cannot go unnoticed, it also aids in the healthy growth of aquatic plants and colours the fishes gorgeously. It comes with a robust design stage filtration system which provides mechanical, biological and chemical filtration which ensures extra clarity of water. Let us start by considering design as an essential factor to review this aquarium.The Fluval Spec V tank is finished with a minimalistic design that can fit perfectly in any small room of your house, apartment or office. The pump and filter are stored separately into a hidden box so that a tidy appearance can be maintained in-house. It has a sturdy glass element and comes in two color options; either you can buy black or go for white that has aluminum trims. Every homeowner needs a compact aquarium so that it can consume minimum space inside.That is why manufacturers at Fluval have created this product with a maximum dimension of 17.2 x 10.6 x 6.3 inches only. You need not worry about space inside because it is pretty good for small fishes. This rectangular shape aquarium is more suitable for betta fish as they can find enough space to move inside. It is really important to buy an aquarium with a clean and elegant appearance that can simply look impressive at your home. This is why manufacturers have added all the filters, and the water pump inside the fish tank. Also, the pump works silently and the powerful filter action leads to clean and fresh water for the fish and plants. The Fluval Spec V Aquarium Kit has a powerful LED light arrangement that can provide life to your low light plants. These LEDs are bright enough and are arranged well to deliver an eye-catching appearance. The day mode activates a nice and bright white light and the night mode is controlled by deep blue LEDs. You will find them really good to maintain a perfect balance of controlled lighting. Integrated 3 stage filtration system with adjustable flow rate. It never makes an annoying noise, the pumping mechanism works silently. The light appears dim; probably it will not be able to serve your low light plants well . You have to buy a heater module as it is missing in this design. Some buyers think the white light is too strong for some species. Doesn’t include some decorations that can help in tank landscaping. If you are searching for a top class fish tank that is very small in size,but big when it comes to overall quality and performance - then the Fluval Spec V Fish Tank is definitely one of the best small tanks to buy online.